We help small farms and producers with web development, social media, branding/identity, and packaging design. We'll guide you in small-scale meat processing. Learn to break whole animals down to salable cuts, develop value-added products (both meat and otherwise) and cover all the legal bases. We work with Union Square Green Market vendors as well as farmers from the Hudson Valley and Western Massachusetts to serve you and your guests a local, rustic and robust meal. We will take you through the breaking down of a whole steer, pig, or lamb. As we cut the first side, we will describe the different cuts - geared to your interests and goals - and how they can be prepared. We can also demonstrate roast tying as well as the best to prepare ground-meat. 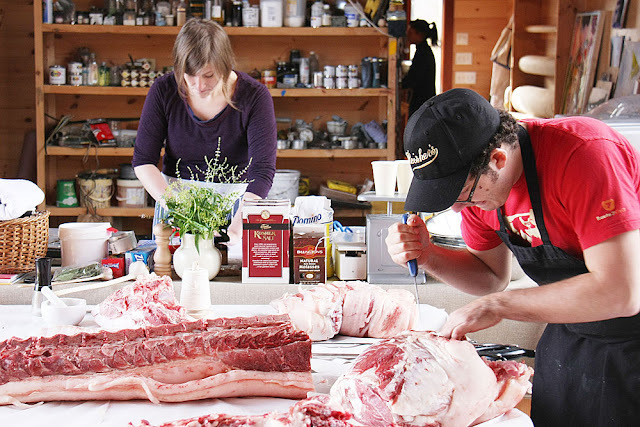 With the second side, we will lead you through the hands-on experience of breaking down the animal from nose to tail. Throughout the demonstration, we will fully prepare cuts for you to try. Same as the Basic Demo, but just for pig. In addition, we will show you how to make fresh sausages, cured hams, bacon, and any other great charcuterie you might be interested in. We will prepare the cures with you and leave you with full step-by-step maintenance instructions. We can also present different ways to create your own amateur smokehouse, cure room, or similar. Same as Pig and Charcuterie Demo. In addition, we will include a full pig-centric meal at the end of the day. Possibilities include pig roast, porchetta, pulled pork, and spit roasted ham. We can also do a similar concept for lamb. Let's talk! Please contact us at cutandbake@gmail.com for pricing and questions.